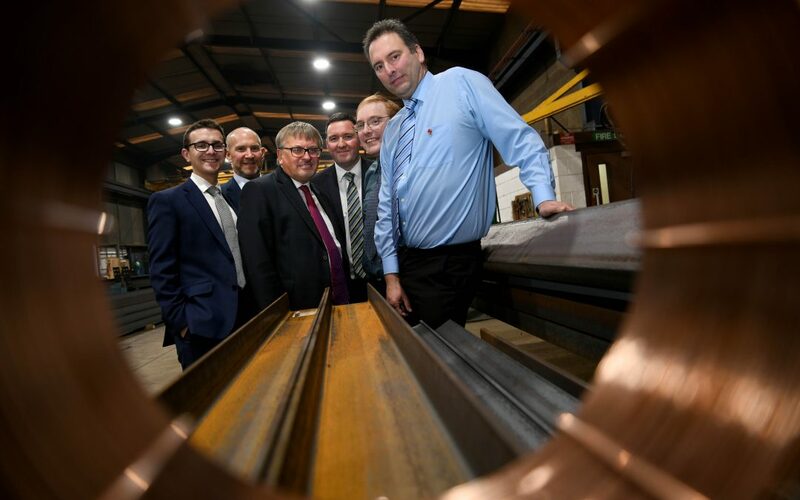 Barnard Castle based Steel Fabricator S&A has announced the sale of the building fabrication side of the business in a management buyout, as a result of major changes at the company over the past two years. With the support of North East advisors, the Barnard Castle business has been purchased by the MBO team at S&A Fabrication, which consists of sales director Simon Pelly and senior estimator Jonathan Kirk. Pelly and Kirk will take over the daily running of the business and lead on future growth plans, with the previous owners Geoff and John continuing to work on a consultancy basis. Accountancy firm Tait Walker, commercial law firm Mincoffs Solicitors and HSBC UK have been working with the MBO team to ensure a smooth process throughout for all parties. Barnard Castle-based S&A Fabrication Ltd, specialises in manufacturing steel framed buildings for the agriculture industry, as well as producing a range of commercial and industrial buildings. Established in 1978 by Geoff Simpson and John Allinson, the firm is known for its popular Roundhouse Buildings Solutions business, a concept which brings advanced, innovative building design to the agriculture market. Originally starting the work in June 2017, Tait Walker has been advising Simon and Jonathan at S&A Fabrication Ltd throughout the entire MBO process. As well as assisting with raising finance from HSBC UK to fund the transaction. Michael Smith and Lucy Elliott from Tait Walker’s Corporate Finance team, worked with Tax Associate Adrienne Paterson to provide transaction and tax advice on the deal structure and Paul Shields who heads up the Durham office. Associate Solicitor Chris Hughes of Mincoffs and Martin Glaholm of HSBC UK advised on the movement of cash through the group structure and the legal process. Michael Smith commented: “We are delighted to have assisted Simon and Jonathan on the successful MBO of S&A Fabrications and Roundhouse Building Solutions. “Through our collaborative approach with Mincoffs Solicitors and HSBC UK, we have played a key part in securing the long-term future of the two established North East companies. The Corporate Team at Mincoffs Solicitors, which included associate solicitor Chris Hughes who led on the acquisition, partner John Nicholson and paralegal Bri Cheng, worked closely with the firm’s Commercial, Commercial Property and Employment teams to deliver advice to the management team on the transaction. HSBC UK facilitated the transaction of S&A Fabrications Ltd by listening to what was required from management teams and putting a suitable finance structure in place. David Slane, Area Director for HSBC UK in the North East, said: “As soon as we met the management teams at both S&A Fabrications and Roundhouse we had great confidence in their vision for the future of the businesses and the retention of jobs for the local area.